*Supported by an ESRC Priority Brexit Grant on 'Brexit and UK and EU Immigration Policy'. This blog post is based on part of chapter 6 of the 4th edition of my book on EU Justice and Home Affairs Law; I have updated it, abridged it, and added a discussion of the issues unique to UK citizens. What happens to UK citizens in the EU27 after Brexit, if they have been living in an EU27 country for some time? If the proposed withdrawal agreement is ratified, they will retain most of their current rights under EU free movement law in the country they live in, although without the right to move freely between Member States any longer. (There will also be a transition period during which UK citizens could still enjoy free movement rights to the EU27, and vice versa). 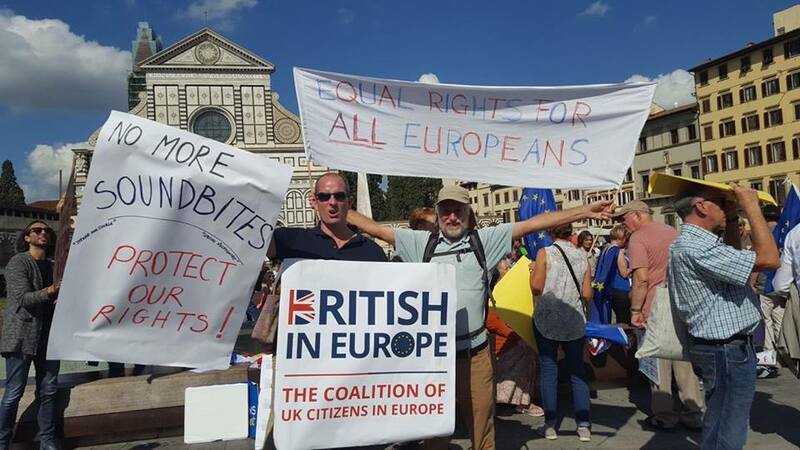 EU27 citizens in the UK will equally retain current rights (for a detailed annotation of an earlier version of the citizens’ rights provisions in the agreement, which do not differ much from the final version, see my blog post). If the withdrawal agreement is not ratified, there is apparently no intention on the part of the Commission to propose an EU-wide law to protect UK citizens’ acquired rights (as I suggested here). So, as the Commission pointed out in its most recent communication, it will be up to each Member State to regulate the position of UK citizens' acquired rights under its national law, subject to partial EU-wide harmonisation of some aspects of immigration law concerning non-EU nationals. (It’s a myth that the EU has no power to regulate the immigration status of non-EU citizens, as I discussed in a recent tweet thread. Note that the UK, Ireland and Denmark have generally opted out of these EU laws, including those discussed in this blog post. This will not stop UK citizens being covered by these laws as non-EU citizens after Brexit). One of the more important such EU measures, as the Commission noted, could be the EU Directive long-term residence for non-EU citizens. It will obviously be relevant if there’s no deal, but it could even be relevant for some UK citizens if the withdrawal agreement is ratified, because it includes limited provisions on movement to other Member States. These fall short of the free movement rights that UK citizens are losing, but are better than nothing at at all. For those reasons, it’s useful to take a look at the Directive, from the particular perspective of UK citizens in the EU on Brexit day. Much of what I say here is, however, equally relevant to any UK citizens moving to the EU afterward, or to citizens of any other non-EU countries (besides those which have free movement treaties with the EU: Norway, Iceland, Switzerland and Liechtenstein). In case the more detailed legal comments below are too daunting, here’s a short summary. The EU Directive on long-term resident non-EU citizens could apply to UK citizens living in an EU Member State after Brexit. They have to have lived there legally for five years, and it’s unclear if residing there as an EU citizen before Brexit counts, although there’s a good argument it does. There are also parallel national laws on securing long-term residence for non-EU citizens, which might be more appealing in practice for UK citizens, particular if it’s easier to apply under those laws. The EU rules will be more relevant to those UK citizens who would want to move to another Member State in future. Anyone uncertain about their legal status should research the national law where they are living further, and if necessary obtain legal advice. The long-term residents’ Directive, which dates back to 2003, has been amended once, in 2011, to extend its scope to cover refugees and persons who have subsidiary protection status. A pending proposal would amend it again, also as regards specific issues relating to people with international protection. I won’t discuss these amendments further, as UK citizens could not in principle apply for refugee status in the EU before Brexit, and I doubt that many UK citizens applied for subsidiary protection status either, given that they could enjoy free movement rights. (There may be some cases, however, where UK citizens are married to a refugee or person with subsidiary protection; the Directive might be relevant to those spouses). (Note that some UK citizens will retain secondary free movement rights after Brexit – ie as the family member of an EU citizen who has moved to another Member State, such as an Irish citizen in Germany). The long-term residence (LTR) Directive is not the only EU law which allows non-EU citizens to move between Member States. There are special rules on this issue set out in the Blue Card Directive on highly-skilled workers (which is being amended: see discussion here); the Directive on researchers and students (see discussion here), and the Directive on intra-corporate transferees (see discussion here), even before such persons have attained long-term residence status. The Blue Card directive also contains special rules on obtaining long-term residence status, but I won’t discuss them further here, since they won’t concern UK citizens resident in EU States before Brexit day. There have been several references to the CJEU on the interpretation of the Directive, namely: Kamberaj, Commission v Netherlands, Singh; Tahir; P and S, discussed here; CGIL and IMCA; and López Pastuzano, discussed here. The Court also discussed the Directive in its judgments in Case C-40/11 Iida and Ziebell, and the pending cases of YZ and X have asked the Court to interpret the Directive again. The Commission also presented a report on the implementation of the Directive in 2011 (the ‘2011 report’). The principal purpose of the Directive, according to its preamble and CJEU case law (Kamberaj, among other judgments), is to integrate third-country nationals who are long-term residents. It also aims to approximate their legal status to EU citizens (mentioned in the Singh judgment). Furthermore, the provisions on movement between Member States aim ‘to contribute to the effective attainment of an internal market as an area in which the free movement of persons is ensured’ (mentioned in Commission v Netherlands). The LTR Directive creates enforceable rights: third-country nationals who satisfy the conditions ‘have the right to obtain long-term resident status as well as the other rights which stem from the grant of that status’ (Commission v Netherlands). According to the Court, the equal treatment rules in the Directive are the general rule, and exceptions from that rule must be interpreted strictly (Kamberaj). In light of the objective of the Directive, the same approach should arguably apply to all of the conditions and derogations from the Directive, along with exclusions from its scope (see the Opinion in Commission v Netherlands, which argues that the conditions for obtaining LTR status must be interpreted strictly). The EU rules on LTR status co-exist with national rules dealing with the same issue. The Directive states that Member States may create or maintain national systems that are more favourable than the rules in Chapter II, but acquisition of status under such more favourable rules will not confer the right of residence in other Member States. According to the CJEU, it follows that a residence permit obtained on the basis of such more favourable rules cannot constitute an EU LTR permit at all (Tahir). According to the 2011 report, 13 Member States have maintained national rules, and 14 of them force a choice between a national permit and an EU permit. The report argues (correctly, in my view) that this is a breach of the Directive, since it does not provide for Member States to impose such a condition. However, if some Member States are still insisting on this, it would create a dilemma for a UK citizen living in one of those countries in practice (unless he or she wants to litigate the point), as it forces them to choose which to apply for. It might be easier to obtain a national permanent residence status, but an EU LTR status will be more appealing for any UK citizen who contemplates moving to another Member State. Chapter I of the Directive sets out its purpose, definitions, and scope. It applies to all lawful residents of a Member State who are third-country nationals (‘legal residence’ is defined by national law: Singh), except for: diplomats; persons who are seeking refugee, temporary protection, or subsidiary protection status, or who have received temporary protection; students; and those who ‘reside solely on temporary grounds such as’ au pairs, seasonal workers, cross-border service providers, workers posted by a cross-border service providers, or persons whose ‘residence permit has been formally limited’. In light of the objective of the Directive, the list of exclusions from its scope is arguably exhaustive. If that is correct, the Directive therefore applies, for instance, to citizens of a former Member State, to family members of third-country nationals (ie a non-UK family member of a UK citizen), and third-country national family members of EU citizens, whether those persons have moved within the EU with their sponsors (and are therefore covered by EU free movement law) or not (ie either a UK citizen married to a German citizen in Germany, or a UK citizen married to a German citizen in Austria). As noted above, the latter group of UK citizens will have secondary free movement rights anyway; the LTR Directive would be relevant if they wanted to secure their legal status separately from their family member. But what about the express exclusions: are they relevant to UK citizens? In the discussion below on the five-year waiting period, I discuss two alternative possibilities: a) prior residence on the basis of EU free movement law is sufficient to be covered by the Directive; or b) prior residence on the basis of national law is required to be covered by it. I argue that the former interpretation is more convincing, but if the latter interpretation applies, then the exclusions from the scope of the directive are also relevant for UK citizens. The asylum-seeker exclusion is irrelevant, but the exclusions for diplomats, students, and those with ‘formally limited’ residence permits or who ‘reside solely on temporary grounds’ could be relevant. (They would also be relevant to UK citizens who have not got five years’ residence yet, because they will affect whether they could get LTR status in future). A UK citizen could still get LTR status if they had switched to another type of activity – a diplomat who became a worker, for instance – but when it comes to qualifying for LTR status, prior residence as a diplomat or on a temporary permit does not count at all, while prior residence as a student must be discounted 50%. The CJEU interpreted the ‘formally limited’ and ‘temporary grounds’ exceptions in Singh, noting that they were two different things, and that ‘formally limited’ should have a uniform EU interpretation -meaning a type of permit that prevented long-term residence in practice. Furthermore, the list of ‘temporary grounds’ exceptions was not an exhaustive list of activities which are ‘per se of a temporary nature’. The 2011 report indicates that five Member States are in breach of this provision (as subsequently interpreted by the CJEU), excluding migrants from LTR status ‘even though their residence permit may be renewed for a potentially indefinite period, without any definite time limit’. This affects, for instance, ‘artists, athletes, ministers of religion, social workers, researchers, family members of permanent third-country nationals, and low skilled migrant workers’. The Directive is without prejudice to more favourable provisions of EU or mixed agreements with third states, pre-existing treaties of Member States, and certain Council of Europe migration treaties and treaties relating to refugees. So a treaty between the UK and EU could set higher standards, but there seems no prospect of that at the moment. The basic rule is that third-country nationals are entitled to such status after residing ‘legally and continuously for five years in the territory of the Member State concerned’ before their application for status. Being the family member of a long-term resident does not exempt a migrant from this rule (Tahir). This definition does not limit itself to lawful stays on the basis of a residence permit, and so the 2011 report criticizes five Member States (in my view rightly) for not counting stays on the basis of (for instance) long-stay visas. By analogy, it should follow that UK citizens, who were entitled to live in a Member State on the basis of free movement law, are covered as long as they were there lawfully and continuously for five years. But how can we apply this test to people who were resident on such a different legal basis? Of course, there is no precedent for this issue in CJEU case law, since no Member State has left the EU before. Fortunately, there is a precedent the other way around: in Ziolkowski, the Court ruled on the position of an EU citizen who had lived in a Member State before their country joined the EU, and then continued living there afterward. In the Court’s view, such persons could potentially obtain the right to permanent residence under EU free movement law, counting their pre-accession period of residence to that end, but that pre-accession residence would have to match the conditions on which an EU citizen could stay in another Member State. In Alarape and Tijani, the CJEU added that permanent residence was only possible for EU citizens meeting the criteria of the EU citizens’ Directive, not other EU free movement law legislation. Applying Ziolkowski by analogy, time spent by UK citizens in a Member State before Brexit should count towards the acquisition of long-term residence by a non-EU citizen, whether that means the UK citizen would therefore already qualify for long-term residence status or can use that time toward qualifying for it in future. But how precisely should we apply this analogy? Should all the time spent on the basis of EU free movement law count? In that case, should only time spent on the basis of the citizens’ Directive count? Or should the Member State be able to argue that only time spent on the basis of national law on non-EU citizens, taking account of the exclusions from the long-term residence Directive, should count? In my view, the most generous approach – taking account of all time spent on the basis of any type of free movement law, for as long as free movement law was applicable – should apply. All of that period meets the basic test of being lawful residence, and it is egregious to retroactively erase time spent as a diplomat or student, or on some other legal basis, from counting toward long-term residence status. If the EU institutions cannot make the effort to pass an EU-wide law uniformly guaranteeing UK citizens’ legal status, the very least EU law could offer is full recognition of periods spent on the territory on the basis of free movement law. Next, absences from the host Member State of up to six months at a time, totalling no more than ten months during the five-year period, must be taken into account in calculating that period. Member States may permit longer periods of absence for ‘specific or exceptional reasons of a temporary nature and in accordance with their national law’, but such absences will not count toward the qualifying period (in other words, the clock will be stopped). But Member States may allow the clock to keep ticking if a person is detached for employment purposes. As noted above, prior residence as a diplomat or on a temporary permit does not count at all, while prior residence as a student must be discounted 50%. The 2011 report states that all except six Member States use these optional rules. These rules are more restrictive than EU free movement law rules on obtaining permanent residence: but if my interpretation of how Ziolkowski applies by analogy to UK citizens is correct, the EU free movement rules on absence should apply instead, for as long as free movement law was applicable. Long-term resident status shall be denied on grounds of insufficient resources, or lack of sickness insurance (see by analogy the CJEU interpretation of the equivalent provisions in the Directive on family reunion for non-EU citizens, in Chakroun and Khachab). Note that this is more restrictive than EU free movement law, which only applies those requirements for EU citizens present on non-economic grounds. The pending case of Z raises the important question of whether the resources can be provided by another person besides the would-be LTR, such as a family member (EU free movement law permits this). This issue is particularly relevant for stay-at-home parents or disabled people. Again, my interpretation of Ziolkowski would apply the EU free movement rules instead to UK citizens, for as long as free movement law was applicable. Member States may require applicants to fulfill integration conditions, or refuse to grant status on grounds of public policy or public security. In light of the objectives of the Directive, the list of conditions to obtain LTR status should be regarded as exhaustive (see the opinion in Commission v Netherlands; the 2011 report is critical of Member States which impose a housing requirement or require a settlement permit). Although the Directive, unlike some other EU migration Directives, does not expressly regulate the issue of fees for applications, the CJEU has ruled that excessively high fees for LTR applications can diminish the effectiveness of the Directive, and so amount to a breach of Member States’ obligations (Commission v Netherlands and CGIL and INCA). Integration conditions do not apply under free movement law, and the CJEU has interpreted them in the context of equal treatment (see below). Again, my interpretation of Ziolkowski would mean that when UK citizens were subject to EU free movement law, those rules would apply instead to UK citizens, for as long as free movement law was applicable, which would exempt them from fulfilling integration requirements. As noted below, the public policy and public security rules are interpreted consistently with EU free movement law anyway. The Directive also sets out detailed rules on the procedure for acquisition and withdrawal of long-term residence status. According to the CJEU, a third-country national does not obtain LTR status automatically, but has to apply for it (Iida). This is more restrictive than free movement law. There is a right to ‘mount a legal challenge’ if LTR status is rejected or withdrawn; it is again arguable that given Strasbourg jurisprudence, the general principles of EU law, and the EU Charter of Fundamental Rights, this must, inter alia, include the right to argue the merits of any issue falling within the scope of the Directive before a court or tribunal (see by analogy EP v Council and El-Hassani). LTR status ‘shall’ be lost due to its fraudulent acquisition, the adoption of an expulsion measure, or following absence from the EU (not just the particular Member State which granted the status) ‘for a period of 12 consecutive months’, although Member States may provide that absences for longer periods or for ‘specific and exceptional reasons’ will not lead to loss of the status. Where status is lost due to departure from the EU or a lengthy stay in another Member State, Member States must establish a procedure to ‘facilitate’ re-acquisition of the status. The 2011 report states (correctly in my view) that the list of grounds for loss or withdrawal of LTR status is exhaustive – ie, Member States can’t remove long-term residence status for any reason besides those listed in the Directive. The pending YZ case asks the CJEU to clarify the provision on loss due to fraud. This is more restrictive than under free movement law (loss after two years’ absence) or the withdrawal agreement (loss after five years’ absence), although fraud is also an exception under free movement law. Substantively, long-term residence status entitles its holders to equal treatment with nationals in a number of areas: employment and self-employment; education and vocational training; recognition of diplomas; social security, social assistance, and social protection ‘as defined in national law’; tax benefits; access to goods and services; freedom of association; and free access to the territory. The 2011 report suggested that some Member States were applying unjustified restrictions as regards university fees, equal treatment, and movement on the territory. However, there are exceptions: Member States can impose residence requirements in most cases (according to the 2011 report, 12 Member States apply residence conditions), limit access to employment and education, and ‘limit equal treatment in respect of social assistance and social protection to core benefits’. The CJEU clarified the latter provision in Kamberaj, ruling that housing benefit restrictions in the Italian province of Bolzano breached the equal treatment rule because they were calculated on a different basis for third-country nationals. While the reference to national law in principle meant that it was up to each Member State to define the meaning of ‘social assistance and social protection’, the national court also had to take account of Article 34 of the EU Charter of Fundamental Rights, which referred to a right to ‘social and housing assistance’ as regards combatting poverty and social exclusion. As to whether housing assistance was a ‘core benefit’, the CJEU ruled that this exception had to be interpreted strictly, and that the list of such benefits in the preamble to the Directive (which does not mention housing benefit) was non-exhaustive. There was an implied procedural obligation to announce that a Member State was invoking the derogation (which Italy had not done), and the Court, again taking account of the Charter, defined core benefits as those ‘which enable individuals to meet their basic needs such as food, accommodation and health’. The Court also noted that there is no possibility to restrict equality to ‘core benefits’ as regards social security. While it was up to the national court to apply the Court’s reasoning to the case, on the whole the Court strongly supported equal treatment rights in this case. In contrast, the Court seemed less concerned by the equal treatment of long-term residents in the P and S judgment. This case concerned third-country nationals who had already obtained long-term resident status, but were still subjected to an integration requirement. The Court ruled that this obligation did not fall within the scope of the equal treatment rule because Dutch citizens could be presumed to have knowledge of Dutch society and the Dutch language, whereas non-EU citizens could not. But it went on to assess whether the requirement compromised the effectiveness of the Directive. In principle it did not, because the main objective of the Directive is the integration of long-term residents, and learning the national language and about the host State could facilitate communication with Dutch citizens. Acquiring a knowledge of Dutch also ‘makes it less difficult’ to find work and take up training courses. The integration requirement therefore contributed to the aims of the Directive. However, the Court did place some limits upon what Member States can do, as regards ‘the level of knowledge required to pass the civic integration examination’, ‘accessibility of the courses and the material necessary to prepare’ for the exams, the level of registration fees, and ‘specific individual circumstances, such as age, illiteracy or level of education’. In particular, the Court ruled that the fines for failing the exam were too high and were imposed too often (for every failure, or even where the long-term resident had not sat the exam within the required time), on top of the high fees to sit the exam. As the opinion in P and S noted, some Member States exempt citizens of some non-EU countries from an integration test; it remains to be seen whether the UK will be one of them. Next, long-term residents are also entitled to enhanced, although not absolute, protection against expulsion, which is clearly based on ECHR jurisprudence on the right to family and private life, which requires States to balance the seriousness of any criminal conviction of a migrant with the degree of that migrant’s integration into society and family links when deciding on whether to expel them. The CJEU has linked this protection to the safeguards accorded to EU citizens before the advent of the EU citizens’ Directive (Ziebell), which suggests that for long-term resident non-EU citizens, the protection against expulsion may not be vastly different than for EU citizens. Moreover, in López Pastuzano the CJEU emphasised that (as with EU free movement law), expulsion of a long-term residence following a conviction could not be automatic, but could only be on the basis of a case-by-case assessment. Chapter III concerns the exercise of the right of residence for periods above three months in other Member States, other than as a posted worker or provider of services; Member States can also set out national rules on seasonal workers or frontier workers. There are a number of restrictions compared to EU free movement law: Member States can impose labour market tests limiting movement on economic grounds, or an overall quota on the numbers of third-country nationals (if that quota existed at the time of adoption of the Directive), along with special rules restricting movement of seasonal workers or cross-border workers. The right of residence can be exercised if the long-term resident is pursuing an economic activity or a non-economic activity, but the ‘second’ Member State can insist that the long-term resident has sufficient resources and sickness insurance and comply with integration measures, provided that such measures were not already complied with in the first Member State. Long-term residents can bring with them their ‘core’ family members as defined by the EU’s family reunion Directive (which is more restrictive than the family reunion rules in EU free movement law), but the second Member State retains the option to decide whether to admit other family members. Again, sickness insurance and sufficient resources tests can apply. Admission of long-term residents and their family members can also be refused not only on grounds of public policy and public security, but also public health. The potential ‘second’ Member State must process the application within four months, with a potential three-month extension. The CJEU has ruled that the fees for the LTR’s application to move, along with his or her family members to join them, cannot be excessive (Commission v Netherlands). If the various conditions are met, the second Member State must issue the long-term resident and his/her family members with a renewable residence permit. Reasons must be given if the application is rejected, and there is a ‘right to mount a legal challenge’ where an application is rejected or a permit is withdrawn or not renewed. Once they have received their residence permit, long-term residents have the right to equal treatment in the second Member State in the same way as the first Member State, ‘with the exception of social assistance and study grants’, and subject to a possible one-year delay in full labour market access (again more restrictive than EU free movement law). Family members have the same status as family members under the family reunion Directive as regards access to employment and education, once they have received their long-term residence permit. Before the long-term resident gains long-term resident status in the second Member State, that Member State can remove or withdraw his or her residence permit and expel the long-term resident and family in accordance with national procedures on grounds of public policy or public security, where the conditions for admission are no longer met and where the third-country national ‘is not lawfully residing’ there. The first Member State must readmit such persons, although if there are ‘serious grounds of public policy or public security’, the person concerned can be expelled outside the EU. Once the conditions for obtaining long-term resident status are satisfied in the second Member State, the long-term resident can apply for long-term resident status there, subject to the same procedural rules that apply to initial applications for long-term resident status. According to the 2011 report, there were a number of legal and practical problems applying the various rules on movement to a second Member State. On the whole, this Directive is an accomplishment simply because it facilitates the security of residence, equal treatment, and free movement of third-country nationals more than EU law previously provided for. Nevertheless, the 2011 report indicates that only about half a million third-country nationals had qualified as LTRs, despite a far higher eligibility. The numbers are lower than they would otherwise be in large part because of breaches in national implementation of the Directive (notably the forced choice between the national and EU LTR systems). The defective implementation of the conditions for obtaining LTR status (notably as regards housing) is also problematic. Unfortunately the Commission has not brought any further infringement proceedings besides its earlier challenge to the fees charged to LTR applicants by the Netherlands. As for movement to a second Member State, since there are many express possibilities for Member States to limit movement of long-term residents, it should follow that unless one of these express exceptions applies, long-term residents enjoy equal treatment as regards the initial take-up of employment, self-employment, or non-economic activities in the second Member State. Also, it appears that the Directive can be used where a long-term resident wishes to move between Member States to join a sponsoring family member in another Member State. This means that such persons will only have to satisfy the criteria for obtaining long-term residents’ status, and may therefore avoid the limitations and conditions set out in the family reunion Directive, or the exclusion from EU free movement law of EU citizens who have not left their own Member State. For example, a UK citizen with long-term resident status in France could rely on that status to move to Austria to join a family member there. For UK citizens in particular, the Directive could be useful if national law on long-term residence is harder to qualify under, or if they are particularly keen to move to another Member State, taking account of the stricter conditions of doing so as compared to EU free movement law. And what about EU citizens in the UK in a "no deal" scenario? Do you have then 3 million Illegals there? I mean, they don't have any sort of visas and -unless they already have obtained a permanent settled status or a leave to remain status- are left without a legal status as the EU laws cease to apply. Sorry, this nothing, but a piece of paper. This government is led by the woman who introduced the hostile environment. This government hasn't got a majority in the Commons. This government deported British citizens to the Caribbean. The responsible minister at the time is now back and the great hope for a "common sense" Brexit. This government outsourced the management of deportation camps to the private sector and hasn't got a problem with regular suicides there. This government systematically sabotages the naturalisation process by using second class mail, while setting tight deadlines for responses. The responsible minter Noakes is not interested in problems and not really informed. This minister also shall -at same time- make the border force ready for increased customs checks, a duty with it already struggles which one can see in the OLAF demand against the British government to compensate for endemic VAT fraud in the last years. The senior minister has nothing better to do than to incite and exploit the fear of a handful refugees. This kafkaesque, understaffed ministry with an irresponible leadership shall be of any comfort? This government is already overwhelmed with the administrative nightmare of enacting the withdrawal. In a no deal scenario this paper is worthless. The immigration rules for the settled status system were adopted back in the summer. As long as they are the law then "all EU27 citizens will be illegal" is not a tenable interpretation. I agree that the Home Office is prone to error and people without documentation will likely fall into difficulties. Well, they are in a legal vacuum as long as their applications are "processed". Regarding the sheer number of 2.5 million (without the Irish who can fall back on the Common Travel Area), this legal vacuum (lawlessness?) can last for months, if not more than a year. There's no general legal vacuum as long as the immigration rules cover their position. In your opinion, which is the best country (best chance of UK cits being able to stay), if they have less than five years? Obviously Ireland, since free movement will continue. Otherwise it's impossible to say - you would need to look at the details of what different States do, and some laws might not be proposed or adopted yet. Can non EU/non UK family members in Ireland rely on the LTR directives if as you mentioned Ireland opted out of the directive? Thanks Steve, a no deal will be a real car crash. Thankfully we have an Irish daughter and can reply on Zambrano if it comes to it. For others it's very tough unless Ireland makes an arrangement for non-EU spouses. Something that I am curious about, is Germany's approach to this seems to be "UK citizens become third-country nationals and we already have rules for third-country nationals". Now, there are a fair number of British nationals living in Germany who do not meet the citizenship requirements, and who do not have university degrees or two-year qualifications; now, my reading of the third country nationals rules for Germany is that unless a vocation or industry is listed as having a skills shortage, third country nationals need at least a recognised vocational qualification from a two-year study, in order to get a permit (alongside a job offer). With no word about how rigidly things will be enforced, besides an official FAQ that says "no-one will have to leave Germany immediately, there will be a three month transition period", is it a possibility that some British citizens who have already been working in Germany for a couple of years find out at some point between March 30th and June 30th that they don't meet 3rd country requirements and so cannot continue in their current jobs? You would have to look closely at the law to see how it fits in with the EU and national rules on long-term residence, and also whether there is some other basis to stay for those there for a shorter period (student status, family reunion, more general retention of rights). Thank you for this. It's very helpful. You talk about the rights of self-employed people. Do you have a view on whether we will still be able to sell consultancy services to other MSs? I am getting contradictory opinions on this, even with a WA. Thanks in advance. If the withdrawal agreement is ratified, free movement of people will continue during the transition period, including for self-employed UK citizens. After that, it would be up to negotiations on the future relationship. It is possible that this could be covered by the planned free trade agreement in services. I have been in Germany 5.5 years and don't have a uni degree and I'm in an office job so not a skills shortage area. Worth looking into whether long term residence status is available. I am in a similar position to DoubleVision with regards to lack of a degree, although I've only been here 18 months. Both the HR of my Employer and the "Betriebsrat" (workers council) have said that the guidance they are getting from the German authorities is simply "third country national rules will apply if there is a no-deal Brexit". There is no additional guidance, even at this late stage, for how these will be applied in practice as there is no precedent for workers losing their EU citizenship over night. HR have warned that if it's a case of retrospectively applying the rules without any consideration of people being EU citizens at the point that they were hired, then unless someone's occupation is in the "in demand list", then the onus is on whether the Beamter believes that an EU citizen can do the job, and that in situations where the person does not have a degree and does not have a B1 certification, then finding a residency permit that suits that situation could prove difficult. The German position is currently that people already resident in Germany will have three months to transition on to the relevent third country national permit. In the case of DoubleVision, the >5 years should mean eligibility for a Niederlassungserlaubnis or permanent residency, provided that B1 language requirements are met.